We admit students for Fall semester only (not for the Spring). We can accept only full-time students who will be in residence. We offer the M.A. only as the beginning of work for the Ph.D.; we do not offer a terminal M.A. degree. Because our department is committed to bringing a broad range of perspectives into the study of religion, we particularly encourage applicants from minority perspectives. For information on the steps involved in the graduate application, see the sections below. A direct link to the online application (on UNC’s Graduate School website) can be found here. This year’s application deadline, for studies starting in Fall 2019, is December 11, 2018. M.A.-Ph.D. track: A student who does not already hold an M.A. or equivalent degree from another institution will be admitted to the M.A. program, with the expectation that the student will go on to pursue the Ph.D. also. The Department does not offer a terminal M.A. M.A. with opportunity to bypass: Certain students who already hold an M.A. or equivalent degree from another institution will initially be admitted to our M.A. program rather than our Ph.D. program. In such cases, students have the option of petitioning to bypass the M.A. degree after completing one full year of coursework and the Field Examination. For more information about the possibility of bypassing the M.A. degree, see our Admissions FAQ page. Ph.D. track: Certain students who already hold an M.A. or equivalent degree from another institution will be admitted directly into the Ph.D. program. You will be informed of the option under which you have been admitted to the program at the time you are admitted. Identify specific faculty members with whom you might work.Read some of their work to get an idea of their intellectual styles. Contact them directly to get a sense of how well the two of you might work together and how your interests would fit together. Correspond with graduate students already enrolled in the program. Consult our Department’s directory of currently enrolled graduate students to find students who work in areas of your interest. Plan your visit. We encourage potential applicants to visit both the campus and the town of Chapel Hill during the fall semester. We regret that we are unable to arrange visits for applicants between mid-December and mid-February. Review the “For Current Students” section of this website.Here you will see resources for teaching, details about program procedures, and other similarly useful information. An academic writing sample (no more than 25-30 pages) is suggested but not required. For further guidance about completing the application, see Application Requirements. Each element of your application is carefully evaluated by faculty in your chosen field of study. There is no formula or rule as to which element is most important or how they are weighted; each piece of the application provides us with a different kind of information about your abilities and goals. All applications are due by the date set by UNC’s Graduate School. There are no exceptions to this deadline. It is your responsibility to make sure that all the components of the application have been received by that date. Please note that applications are considered only when complete. Students who enroll as out-of-state residents are normally eligible to establish in-state residency and apply for in-state tuition after one year of residency. The Department strongly encourages students to apply for in-state status as soon as possible. For more information, see the Graduate School’s “North Carolina Residency for Tuition Purposes” page. The Department considers all admitted applicants for first-year funding. Some receive non-service fellowships; some are given work as teaching associates (helping faculty teach large courses) or, occasionally, as teaching fellows (teaching their own courses). Although yearly support is contingent on state funding, over the past decade we have been able to support all of our graduate students through at least five years of study. As of 2014-2015, our basic teaching assistantships provided a stipend of $7,850 per semester, plus full tuition and health insurance (though students must pay certain additional student fees). Teaching is a critical part of the mission of our Department, and UNC-CH is particularly notable for the many opportunities that our graduate students have to teach. In their early years in the program, most graduate students serve as teaching assistants, and in their later years, many students teach their own courses as teaching fellows. The Graduate School dispenses a variety of grants and fellowships. Entering students may be nominated by their Departments for a number of financial awards, including multi-year fellowships such as the Royster Fellows and University Fellows. You do not need to do anything to apply for these awards. Our faculty will nominate you if we feel that you meet the eligibility requirements. Timely submission of your application ensures that we will be able to fully consider your eligibility for Graduate School funding. 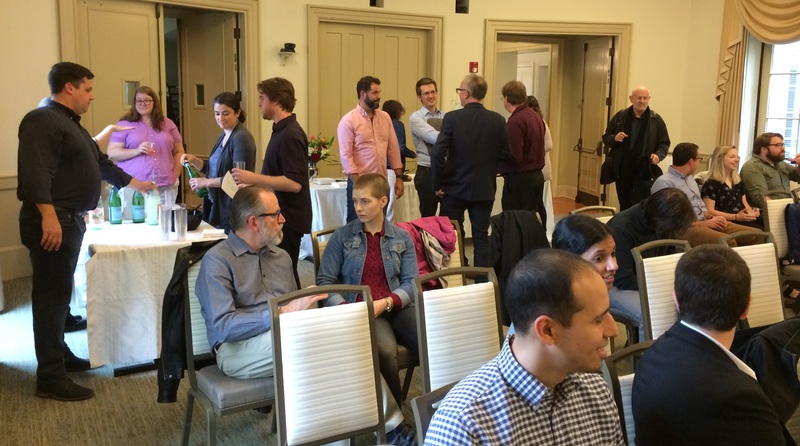 In addition to awards for entering students, the Graduate School offers research and writing fellowships to advanced graduate students and provides small grants to help cover travel to conference presentations and research expenses. For more information, visit the Graduate School’s “Fellowships and Funding” page. Long-term loans and work-study employment are available from the University based on financial need. To be considered for this funding, you must complete the forms indicated by the Office of Scholarships and Student Aid. March 1 is the priority deadline for applying for need-based financial aid for the coming school year. If a student is seeking work-study funds, the Department should be notified that the appropriate paperwork is being completed. Financial aid packages may also include remission (reduction) in tuition to in-state levels. For information about the full set of requirements for an application to the graduate program in the Department of Religious Studies, please see UNC’s Graduate School degree programs list. You will need to upload unofficial transcripts for all undergraduate and graduate work via ConnectCarolina. Do not mail official copies of your transcripts to the Graduate School. Mailing transcripts will significantly delay the processing of your application. If offered admission, one paper official transcript for each university attended will be required at a later date. While many of our accepted applicants majored in religious studies as undergraduates, this is not a prerequisite. Careful attention is given to what courses applicants have taken and how well they have done in them. The average grade point average of both applicants and admitted students is about 3.7 on a 4-point scale. As a rule, the Graduate School does not admit students with an undergraduate GPA below 3.0. Three letters of recommendation must accompany your application. Upload all recommendation letters via ConnectCarolina where instructed. The most helpful letters are those written by faculty who know you well and take the time to assess carefully your aptitude for graduate education. Letters from employers are acceptable, but generally address issues of secondary importance in the admissions process. Each applicant must submit a statement that explains his or her interests in religious studies. Faculty read these statements closely to ascertain an applicant’s aptitude for graduate study and to determine whether the program at UNC-CH would be a good place for the applicant to pursue his or her goals. Upload your statement of purpose via ConnectCarolina where instructed. In 4-6 pages (double-spaced), discuss the following questions. Provide whatever information you think will help us judge whether your background, plans, expectations, and goals are such that our Department is an appropriate context for your academic training. What led you to want to do graduate work in religious studies? In what field of specialization do you wish to work? How will work in the field of your choice at this university prepare you to realize your objectives? What traditions of scholarship do you find useful, interesting, or compelling? Which books, authors, or approaches do you regard as most important for the area(s) of your interest? All applications are due by the date set by UNC’s Graduate School. You can find that date listed at the Graduate School’s information page for the Department of Religious Studies graduate program. There are no exceptions to the final deadline set by UNC’s Graduate School. It is your responsibility to make sure that all the components of the application have been received by that date. Please note that applications are considered only when complete. What Areas Of Specialization Does The Department Offer? The size of the average entering class, counting all specialty fields, is between 5 and 10 students. Our graduate student population, including students both in residence and away from campus, is approximately 40 students. Admission to UNC-CH is very competitive. In recent years we have received over 100 applications per year, and we are able to accept only a small percentage of those who apply. In recent years, the Department has offered admission to around 5-10% of applicants. How High Do My GPA And GRE Scores Need To Be? The average grade point average of both applicants and admitted students in the past few years is about 3.7 on a 4-point scale. As a rule, the graduate school does not admit students with an undergraduate GPA below 3.0. Does The Department Offer A Terminal M.A.? We do not admit students seeking a terminal M.A. degree. Our expectation is that all our students, even those who begin by working on an M.A., are working towards doctoral degrees. If you are interested in obtaining an M.A. degree only, you might want to consider the excellent M.A. program in Religious Studies offered at UNC-Charlotte, the M.A. program in Religion at Duke University, or other M.A. programs at universities or theological seminaries. I Already Have An M.A. Degree. Can I Apply Directly To The Ph.D. Program? Yes. Applicants to the graduate program who have already completed an advanced degree in the study of religion from another academic institution and who can demonstrate sufficient preparation in religious studies may be admitted directly into the Department’s Ph.D. program. Such students are required to demonstrate competency in at least one modern research language relevant to their field of specialization prior to matriculation. In some cases, students who have completed an advanced degree at another institution will be admitted into the M.A. program rather than the Ph.D. program. In such cases, students may petition the Graduate Studies Committee to bypass the Department’s M.A. degree after completing one full year of coursework (18 credit hours) at the M.A. level and after completing the Field Examination. Bypassing the M.A. degree allows students to bypass up to 12 hours of coursework and the M.A. thesis requirement. However, all students initially admitted into the M.A. program are required to take RELI 700 and at least one gateway course, to show competency in one modern research language, and to pass the Field Examination prior to admission into the Ph.D. program. How Much Does It Cost To Attend UNC-CH? The Office of Scholarships and Student Aid offers a breakdown of the estimated costs to attend graduate school at UNC-CH during the current school year, including tuition, fees, school supplies, and living expenses. Currently enrolled graduate students may be able to offer advice about locating inexpensive housing and expectations for living expenses in the Chapel Hill area. What Funding Possibilities Are Available? Although yearly support is contingent on state funding, over the past decade we have been able to support all of our graduate students through at least five years of study. For more information, consult the Department’s Financial Aid page. We encourage potential applicants to visit both the campus and the town of Chapel Hill during the fall semester. We regret that we are unable to arrange visits for applicants between mid-December and mid-February. If you plan to visit campus, you should first arrange appointments with faculty members in your chosen field of study before coming to Chapel Hill. Most general questions about the program can be answered over the phone by the Program Assistant or by the Director of Graduate Studies. How Successful Is The Program In Placing Its Students? In recent years our placement rate for graduates has been 90-100%, most of those in tenure-track positions at liberal arts colleges and universities. If you have questions about a specific field of study, please address them to an appropriate faculty member. Thanks for your interest!